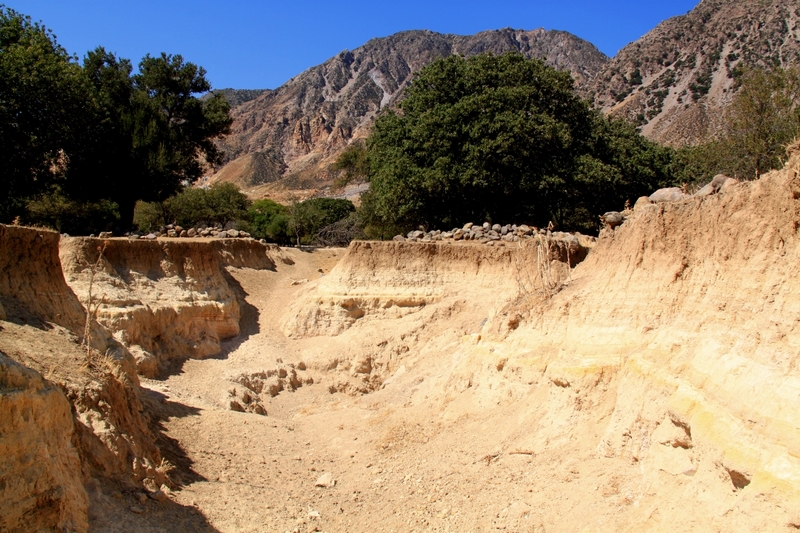 ← Nisyros: stumbling into the past. Slightly later than recently I set out at 10.0 and walked first to the caldera. Yet again I saw no one else out walking in the mountains. 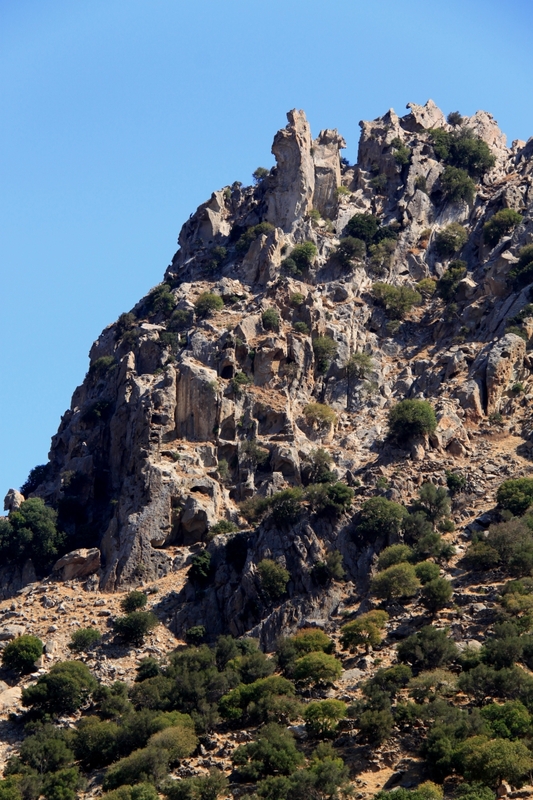 This is Prime Walking Season in Greece with sunshine but temperatures cooling off to around the mid 20’s. OK, today it was warmer as after a few days of cloud over the central block of mountains it was again cloudless. And OK, I admit to being a hypocrite and an OG (Sad Old Git). I set targets for the walk. It was the only way I could do it in the time. First was to get to the caldera in 1½ hours and maintain ‘aerobic’ walking pace (60 steps per minute) on my pedometer all the way. I reached the caldera floor in 90 minutes with two 30 second stops for swigs of ice-cold water. All measured! Well, the times were but not the temperature of the water. That would have been way too compulsive and freaky. I love walking across the caldera. I don’t know why. I guess it’s because it was once so fertile but is now an arid desert with mountain rim of the volcano rising a minimum of 1000 feet and up to 2000 feet all around. Then there is the 2003 seismic fissure which seems to get bigger every time I follow it. The floor of the caldera looking towards Emborios on the rim. The sign reads: ‘Danger Landslip of the territory’ in 3 languages. I headed for the small disused church at the edge of the agricultural part of the caldera and sat for 5 minutes on its roof to have an inch of nutbar and another good swig of water to hydrate me for the climb up to Nikia. It was too early for my banana and in any case I always but always eat at the top of something, never at the bottom. Second target I set myself was to climb the kalderimi to Nikia in half an hour. It took …. 30 minutes . Measured. I kid you not. 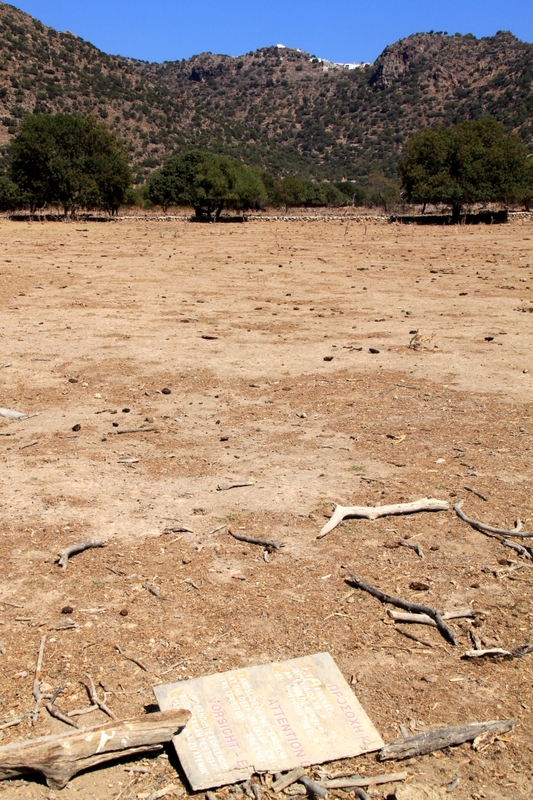 No stops for water. The kalderimi up to Nikia from the caldera is a gem (so is the kalderimi from Nikia to the caldera, but just going the other way). But I was on a mission. Target set! No wandering off to look at interesting stuff. The footpath emerges in the car/coach/vehicle park at the bottom of Nikia and it was crowded with trippers and their coach. Some of them must have walked a whole 30 feet from the coach to the taverna. The rest were just sitting moping in the shade right next to it clutching cameras. I just wanted to shout “get off your fat a***s and walk you lazy lot. This an amazing place.” When they saw me walk to a wall and sit on it to eat my banana some of them took courage and walked 20 feet to peer over the edge into the crater below. After a frappé in the top square (did I mention I’m addicted to frappés? Ice cold with a caffeine kick) I set off down the path which goes around the inside of the rim of the caldera towards Stavros monastery. 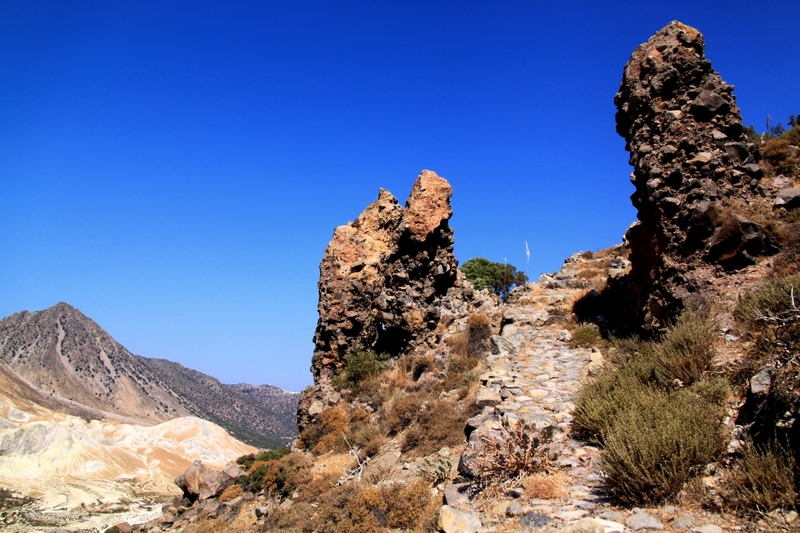 The kalderimi from Nikia down to the saddle before going up to Stavros is a gem. I was on a mission but I did stop to photograph a pair of dramatic lava pinnacles either side of the kalderimi. 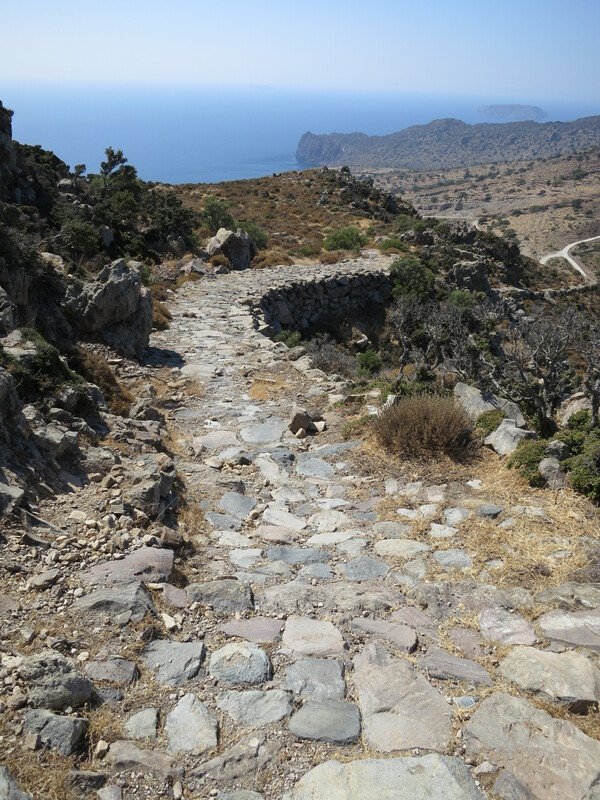 The walk back to Mandraki from Stavros is partly on a bulldozed track which obliterates the kalderimi underneath it in the interests of providing the island with ‘free’ geothermal energy. The geothermal energy never materialised. It was uneconomical. The kalderimi, as much a part of Greek cultural history as the grand archeological monuments, remains obliterated for all time. The track is a pain in the suspension but it links up good footpaths and gets me back to Mandraki. Altogether the walk was about 20 kms with over 1000 metres of ascent through some of the most dramatic landscape around. It took me 6 hours including the ambling around with the camera. And to cap it all off, I arrived back at 16.08, 8 minutes after my target time but in time for a swim. Well chuffed! This entry was posted in Greece and tagged Greece, lava, Mandraki, Nikia, Nisyros, Volcano. Bookmark the permalink.